Cool Yahoo Messenger Archive Decoder allows you to decode and see yours and others yahoo messenger conversation log files (*.dat) in your computer. You won't need to login to your Yahoo Messenger to see others or your conversation nor your will need any password or internet connection to decode the archive. · Cool and easy user interface for easy browsing and to view decoded archive files. · Automatic detection of yahoo user folders and archive files. · No passwords required to decode archives. 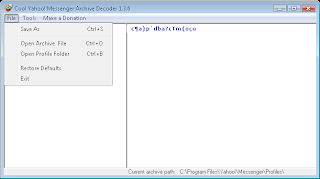 · Decodes Yahoo Messenger archive without logging in. · Feature to decode a single file *.dat file or all the archives together. · Its free without any limitations.